Prince’s Harbour is a small bay along the Flindhome River long ago wrestled from control of the local humanoids and now slowly being converted into agricultural land. The community of Prince’s Harbour is self-reliant and independent – a collection of small “outpost” farmers, woodsmen, miners and so on built up around the small community of Prince’s Harbour itself. This map focuses on a small forested area to the southwest of the community proper and is considered to most to be the furthest point that is still “Prince’s Harbour” instead of the old Flindlands. A small gold mine along the Gnoll’s Ear river is the anchor to this area, with a few supporting farms around it. The road to the east eventually leads to the community proper. Adventurers are most likely to be interested in this area because the virgin forests still may be home to the remnants, descendants, or lost treasures of the beastmen who once had lordship over the area – or of course because of Jendson’s Mine which is certainly going to attract some attention as last year it looked like they had exhausted their small vein of ore, but are suddenly bringing in more gold than ever. Each hex on the map is roughly 100 feet face-to-face. This map is also the first full map released on the blog that was drawn entirely digitally in Photoshop – which has been a learning curve for me. 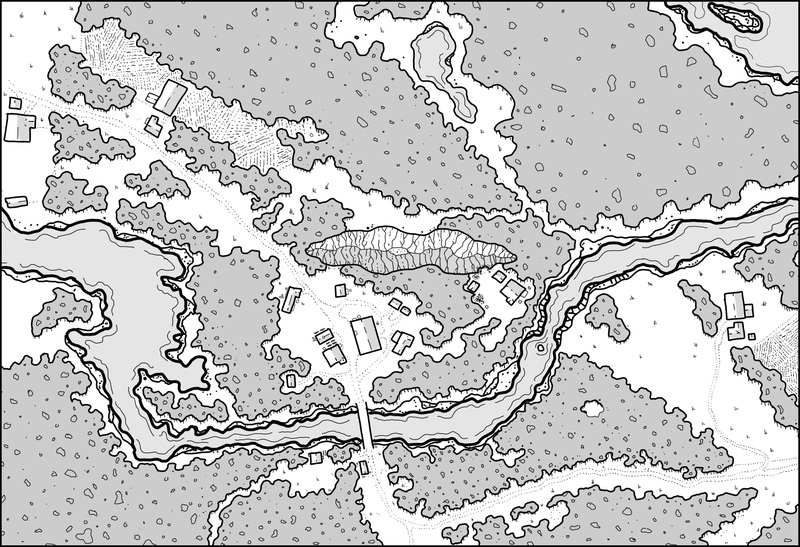 One thing I learned was to increase my resolution a lot – this map is only 300dpi and I had to save it as a jpg to keep file size under control, but I’ve learned a lot of tricks in the month since I drew it and any future digital maps will be back at the more recent 600 to 1200 dpi and file sizes are also kept down. There is already a second map in the set drawn for release next month, and a total of 9 maps will be in the set when it is finished. Does saving as a .png file type help with file size?